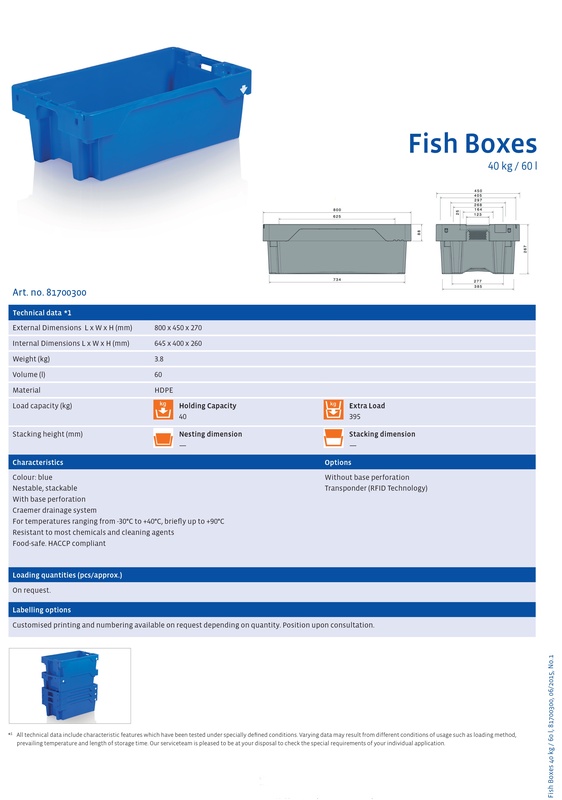 These fish boxes are designed for the daily use at sea and on shore and fulfil all requirements of the international fishing industry. Whether it is catching, processing or trading they are perfect for a range of applications within the supply chain. 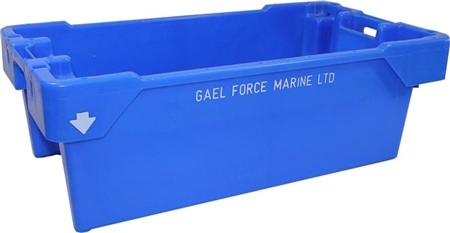 The fish boxes are standard fitted with an outside drainage system, which effectively drains the water laterally to the front side. An optimised base geometry prevents excess water collections. Base openings in the corners facilitate water drainage. There is a load capacity of 40kg with the box being made from impact resistant material. They are temperature resistant from -30 degrees C to +40 degrees C, briefly up to +90 degrees C. Nestable and stackable for space-saving storage and significant reduction of transport costs. Arrow-marking serves as a visual aid for simple nesting and stacking. Perforated base. Sold individually. External Dimensions LxWxH: 800 x 450 x 270mm. Internal Dimensions LxWxH: 645 x 400 x 260mm. Load Capacity Applied Load: 395kg.